The newest generation of tablet PCs have rear-facing cameras, and though they may be underused right now, Metaio is betting that augmented reality could ultimately be a tablet’s killer app. Here’s what they’ve got in store for your iPad. Metaio has just released Junaio 2.6, the latest version of its augmented reality “browser” for mobile devices, along with a plug-in for third-party app integration and a newly freshened-up mobile developer’s kit called Unifeye. Mataio is betting that tablet PCs will find their killer functionality in AR. With the latest refresh of Junaio, which includes enhanced open API access so developers can use more facilities as well as deep integration with Facebook to bring a social angle, the company has really tried to extend its influence across tablet computing. The big thing here is the Junaio plug-in, which means that any developer who currently makes apps for tablets and smartphones could work in an augmented-reality facility. Imagine Angry Birds played on a level that replicates the structure of furniture in your room, and you get some of the idea behind this trick–although there are far more useful applications. AR could be transformational. We’re getting used to AR apps running on smartphones–you may have used one to navigate an unfamiliar city, finding an address or the nearest metro station, or used an AR app to find homes or apartments to rent in a particular area. 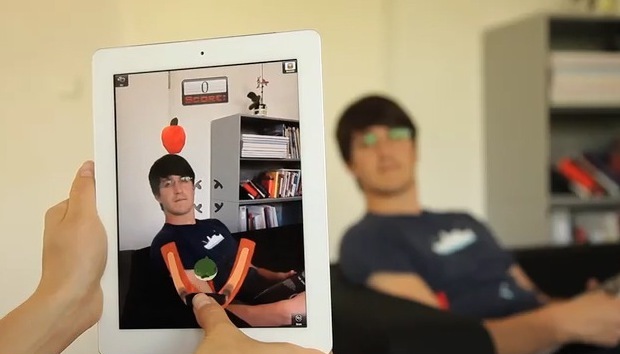 But holding your smartphone up in front of you, which a typical AR app requires, is a slightly frustrating experience. The screen is small, and instead of a rich display of augmented data superimposed on the world, you typically get a peep into the AR world through a tiny portal. Not so on a tablet, where bigger screens can really bring AR to life. Tablets will be used mostly in the home, Metaio thinks, and that’s where it sees AR getting really interesting. Picture struggling with your new set-top box as you try to hook it to your TV: “point your tablet at the device and see a step-by-step virtual guide displayed on top of it.” Comments from social networks could pop up related to real-world objects in your home, service and maintenance could get a digital boost, as could advertising and gaming. And don’t think these are possibilities just for an elite few who are currently toting tablets. Metaio notes that every major hardware manufacturer “has released a tablet or is planning to release one soon,” Goldmann Sachs expects “21 million people to buy a tablet rather than a laptop” in 2011, and they also expect the iPad to make “more money for Apple this year than its entire Mac division.” Metaio sees a tablet-centric future for mobile computing, and imagines itself in the middle of this. All AR is waiting for is the average Joe to realize how useful it is–and that is as close as a single AR-driven app from a big name like Amazon or Facebook.